“Designing with Metal Ceilings” is an educational course from ROCKFON for architects, designers and other building team professionals seeking to expand their knowledge and create beautiful, high-performance, effective ceiling designs. Please email cs@rockfon.com, call 800-323-7164, or click here to find a ROCKFON representative to share this one-hour, in-person presentation. This educational course is approved for credit through the American Institute of Architects’ Continuing Education Systems (AIA/CES), the Green Building Certification Institute representing LEED® certification for the U.S. Green Building Council (GBCI/USGBC) and the Interior Design Continuing Education Council (IDCEC). Equivalent credits also may be available from other professional associations. “With in-person presentations, attendees have the opportunity to ask general questions, as well as to address specific issues for their commercial building projects and local geographies,” says Chris Marshall, ROCKFON vice president of marketing. He continues, “As part of our complete ceiling solutions, ROCKFON offers the largest variety of specialty metal ceiling panels in the industry. Our metal panel products come in a wide range of shapes, sizes and finishes, in standard and custom configurations. ROCKFON metal panels and stone wool acoustic ceiling panels are engineered for easy installation with Chicago Metallic suspension systems.” An overview of the company and its products also is featured with the presentation. More information about these ROCKFON metal ceiling panels, stone wool panels and suspension systems, and educational courses, is available at www.rockfon.com. For additional support, please email cs@rockfon.com or call 800-323-7164. The ROCKFON business is a leading provider of acoustic stone wool and metallic ceiling solutions and suspension systems. 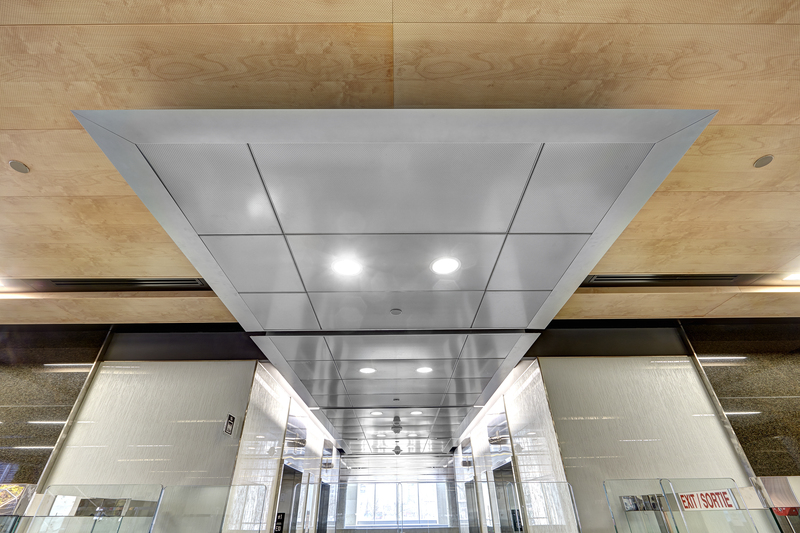 With the acquisition of Chicago Metallic Corporation Inc., the ROCKFON business provides customers a complete ceiling system offering combining stone wool and specialty metal ceiling panels with Chicago Metallic suspension systems. ROCKFON complete ceiling systems are a fast and simple way to create beautiful, comfortable spaces. Easy to install and durable, they protect people from noise and the spread of fire, while making a constructive contribution toward a sustainable future. The ROCKFON business is a subsidiary of Denmark-based ROCKWOOL International A/S, the world's largest producer of stone wool products. ROCKWOOL International A/S is listed on the NasdaqCopenhagen stock exchange. More than 10,000 people in 37 countries are employed within the ROCKWOOL Group. In North America, the ROCKWOOL Group operates under the name ROXUL Inc, ROCKWOOL®, ROXUL® and ROCKFON® are all registered trademarks of ROCKWOOL International A/S. For more information, visit www.rockfon.com.